Discover the picturesque market towns of Helmsley, Kirkbymoorside, Malton, Norton and Pickering, scattered across the Yorkshire Coast and North York Moors. One of Yorkshire’s most popular market towns, Helmsley is situated in the North York Moors National Park with a characterful market place, historic architecture, a wide range of quality independent shops and an excellent selection of award-winning accommodation, pubs, cafes and restaurants. 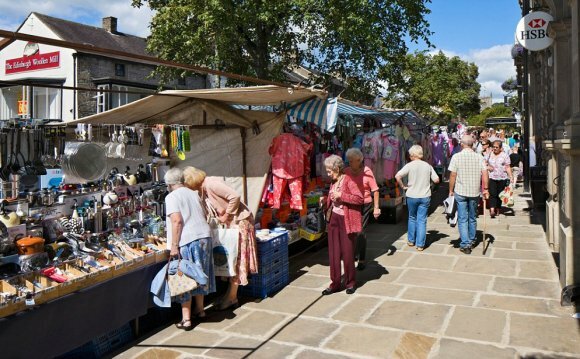 The large market square is filled with a busy street market every Friday and is the starting point of the Cleveland Way National Trail and the Ebor Way. The square is flanked by attractive boutiques, gift shops, pubs and tearooms. There are many local activities and attractions - the town is overlooked by the 12th century ruins of Helmsley Castle with Tudor Manor in the care of English Heritage. The great estate of Duncombe Park, on the outskirts of the town, boasts a fine 18th century landscaped garden and parkland, designated as a National Nature Reserve ideal for walks and picnic spots. It’s also the home of the International Centre for Birds of Prey and Helmsley Walled Garden, which dates back to 1759. Helmsley has the area’s only outdoor swimming pool, open June – September (weather permitting), the stunning All Saints’ Church frescos dating back over 100 years and the thriving Helmsley Arts Centre for theatre, music, cinema, exhibitions and arts activities for all ages. Helmsley hosts major events all year round from the Traction Engine Rally, MAG Weekend and Country Fair in Duncombe Park to the seasonal events in the town itself organised by Helmsley in Business and other local groups, not forgetting the dazzling Christmas Tree Festival. Renowned for the quality and variety of its independent shops, Helmsley is a fabulous food destination with tempting shops and delis, cosy coffee shops, welcoming pubs, fine dining and award-winning fish and chips, as well as a wide variety of fashion and jewellery shops. Expect personal service and a friendly welcome wherever you go – shopping, as it should be.